Then Sardarni told one of her maids to go outside Darbar Sahib and inform her soldiers that they should be prepared for a possible fight outside Darbar Sahib. “Go away from here. You are not fit to stand here in Siri Harmandir Sahib. 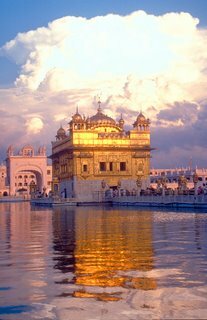 You did not even care about Guru, Sangat and Siri Harmandir Sahib. You did not care that this was not the right time and place to talk about such lowly thing. You are not a Sikh of Guru. Get away from my eyes”. In the meantime, Sardarni Sada Kaur after finishing her ishnaan, started walking towards Siri Harmandir Sahib. She was standing by Darshani DeoRi and the Sardar came out. Both Sardarni and Sardar were engrossed in baani. There were sworn enemies of each other. When they saw each other, both stopped. 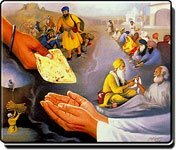 “It is my big fortune (Dhan bhaag) that I am receiving parshaad from that veer’s hands whose hands only handle sword. Well! My visit in the hazoor of Guru Ramdas jee has been successful”. 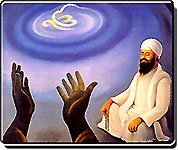 “After listening to the great gift of Guru Sahib to us – Gurbani – I can only derive that we are doing is futile. Only his naam is true and rest is false. Listening to Gurbani brings peace to mind. How foolish are we who indulge in petty enmities and ignore the message of Guru”. 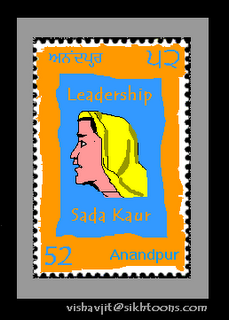 Born in 1762, Sada Kaur was an administrator endowed with the admirable qualities of statesmanship and a courageous warrior. 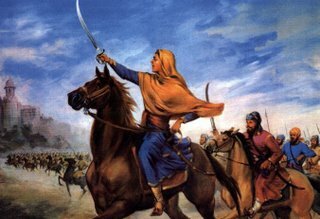 Sada Kaur played a pivotal role in uniting the Khalsa forces under the command of Ranjit Singh to drive out Afghan invaders. When Ranjit Singh received an invitation from prominent citizens of Lahore to end the misrule of the Afghan invaders and take over the city he sought Sada Kaur's wisdom. 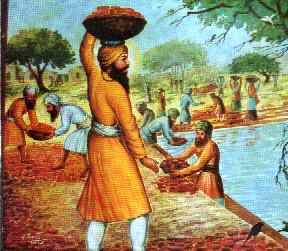 She counseled Ranjit Singh that anyone controlling the capital of the state will inevitably become the master of the Panjab. She however adviced Ranjit Singh to tell his soldiers and commanders not to plunder or inflict suffering on the innocent citizens of Lahore. They were to be instructed to take Lahore not as conquerors but as friends and deliverers. On June 26, 1799 Ranjit Singh marched towards Lahore with his soldiers. Ranjit Singh entered the city through Lahori Gate and Sada Kaur led her horseman through Delhi Gate. Lahore was taken bloodless with little bloodshed or loss of life.